Undergraduate Advising. This page will be updated with news and information for undergraduates in the Theater and Dance majors and minors. Making an appointment with Sean O'Shea, the Undergraduate Advisor: https://sposh.youcanbook.me. Pick any available time and the appointment will be scheduled. Directions to the Theater/Dance offices: We are located in the Theater Dance West building (approximately E-2 on this map: http://www.aw.id.ucsb.edu/maps/ucsbmap.html). Facing the building from the bike path, take the stairs located to the right of the Ticket Office window. Follow the corridor until you are facing an elevator. The offices are through the doors on your left. Any participation in a department production earns you 49/149 units. The ideal process for adding these units is with an add code via GOLD. However, due to audition and run crew timing, sometimes it's necessary to add these units after the deadline for GOLD has past. Here is primer for "Late Add" and "Retroactive Add" petitions/processes. Late Add Petition: Use this form if you are adding units for the current quarter, but are past the add date in GOLD. The form can be found here: http://duels.ucsb.edu/advising/petitions#late-add. Fill in your pertinent information, the Dept. & Course# (e.g. Theater 49, Theater 149, or Dance 149), the Enrollment Code (more on that later*), the Grading Option (usually Letter), Units (1.0 - 4.0, depending on the specifics of your participation), and the Instructor. You do not need to worry about Instructor Code or Repeat. Then fill out the "Student's reasons for not adding by the published deadline:"...usually this is a simple statement that auditions or sign-ups didn't occur until later in the quarter, and you are adding it as soon as you were cleared to participate. Sign and date it, have your instructor sign it, then turn the form in at Cheadle. Retroactive Add Petition: Use this form if you are adding units for a quarter that has already passed. The form can be found here: http://duels.ucsb.edu/advising/petitions#retroactive-add. Fill in your pertinent information, the Dept. & Course# (e.g. Theater 49, Theater 149, or Dance 149), the Enrollment Code (more on that later*), the quarter in which the credit was earned, and Grade Option (usually Letter). Take the form to the instructor to complete, then turn the form in at Cheadle, along with a separate sheet explaining what prevented you from amending your program before the end of the term...usually something along the lines of stating that auditions or sign-ups didn't occur until later in the quarter, and it fell through the cracks. *Enrollment Code: At the beginning of a quarter, there is one blanket enrollment code for each of these courses. As registration progresses, each instructor is given their own enrollment code. If you are at the point of using a Late Add or Retroactive Add Petition, an enrollment code likely exists for your instructor that is different from the blanket code in GOLD. You can get the specific enrollment code from me, OR you can use the blanket code as long as you have the correct instructor (the college will make the appropriate assignation based on the information you provide). If this is confusing, or when in doubt, contact me for a code. Q: So...what is Theater 29D and Theater 29A-B-C, and how do I go about satisfying these requirements? A: Theater 29D is the Run Crew requirement. Every theater and dance major and minor is required to do Run Crew for at least one production. 29A-B-C are the Practicums; Dance majors need to complete one of the three, and Theater majors need to complete two. Theater Design Concentration majors and Design & Production Minors need to complete all three. Q: Do I sign up for 29D during my registration pass times? A: No. Run Crew assignments are coordinated at the beginning of each quarter, when the production calendars are set. 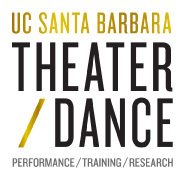 At the beginning of a quarter, the calendars are posted on the Student Call Board section of the department website, found here: http://www.theaterdance.ucsb.edu/academics/call-board (click on the RUN/WARDROBE CREW THTR 29D/49/149 link). If any of the production Run Crew commitments fit in your schedule, click on the GauchoSpace link at the top of the section and follow instructions for stating your availability. You will then be contacted to come in for your assignment and to receive an add code. Our Technical Director, Paul Barnes (pbarnes@theaterdance.ucsb.edu) coordinates the Run Crew assignments. Q: What is Theater 29A-B-C and how do I sign up? A: These are known as the Practicum classes. A is Scenic, B is Lighting, and C is Costuming. These have historically been offered every quarter on Tuesdays/Thursdays in two sections each: 1:00-2:50 and 3:00-4:50. In these classes, you will be working in the relevant shop, helping with the Scenic, Lighting, or Costume construction for that quarter's Theater and Dance productions. In exchange, you have an opportunity to learn as much about these techniques and skills as your curiosity takes you. Q: How many units are these classes or Run Crew commitments worth? A: 29A-B-C and 29D are each worth 1.0 units. If you have a Run Crew (29D) assignment with responsibilities and time commitments beyond the 1.0 units, you will receive additional 49/149 units. Q: Do you, Brian, have any thoughts or suggestions about these requirements for me as the student? *Strive to complete these requirements early in your career. Keep these on your radar during registration each quarter until you have completed them. *Because they are required for all of you, and because the enrollment capacity is small, the Practicums always fill up during the first pass. If it fits on your schedule, use your first pass time to enroll. I will always establish a wait list for the Practicums as well. *Exceptions and/or substitutions for these requirements are granted rarely and reluctantly. Again: strive to complete these in a timely manner and you won't have an issue.